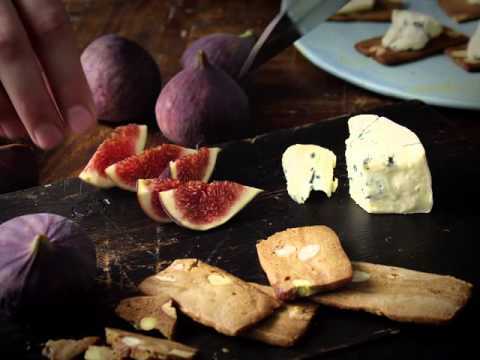 A strange yet delicious mix of sweet cookies and savoury cheese - our recipe for Gingerbread cookies with blue cheese, fresh figs and honey might sound like an odd combination, but the creamy blue cheese will add deep flavours from the savoury kitchen to a dish that very much belongs in the sweet ktichen. 1. Melt butter, syrup and brown sugar in a saucepan over moderate heat. 2. Mix cinnamon, ground cloves, ground ginger and ground allspice with wheat flour, almonds and unsalted Pistachio kernels. 3. Stir potash with 1/2 tbsp. water. Mix the melted butter with the potash and flour mixture. Knead it all together into homogeneous dough without kneading for a long time. Form the dough into a rectangular cylinder of about 5 cm and wrap it in cling film. Place the dough in the refrigerator for about 3 hours. 4. Slice thin whole slices of dough and bake them on a baking sheet on cookie sheet at 180°C for about 10 - 12 minutes. Cool on a wire rack. 5. Cut 400 g. Castello Creamy Blue in small triangles and spread over 30 brown cakes. Garnish with slices of fresh figs and a little acacia honey.